Copies of the last edition of Hungarian broadsheet daily Magyar Nemzet, will close its operations from Wednesday after 80 years in print, are printed in a printing house in Budapest, Hungary, April 10, 2018. One of Hungary's two national opposition dailies will shut down on Wednesday due to financial problems, its publisher said, in a sign of rapidly deteriorating prospects for media freedom after the landslide re-election of Prime Minister Viktor Orban. The closure of Magyar Nemzet will be a milestone in the gradual disappearance of independent media in Hungary that western European Union leaders and international rights groups say underlines the country's slide into authoritarianism. The 80-year-old daily is owned by tycoon Lajos Simicska, once an ally of the right-wing nationalist prime minister who fell out with him and became one of his staunchest opponents in the election campaign. Simicska's media holdings, once highly profitable, incurred heavy losses after he fell out with Orban and his publications were deprived of government advertising. Journalists of Hungarian broadsheet daily Magyar Nemzet, that will close its operations on Wednesday after 80 years in print, work on the last edition in Budapest, Hungary Aprill 10, 2018. "Due to the financing problems of Magyar Nemzet, the owners have decided to cease media content production activity from April 11, 2018. Therefore Magyar Nemzet and its online version mno.hu will close," the publisher said in on its website. The timing of the announcement, two days after Orban won a two-thirds majority for the third time with the ability to amend the constitution to entrench his power, suggests the newspaper's closure had political dimensions. 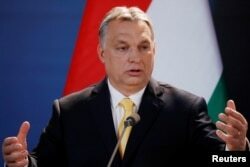 "Simicska dedicated his past year to revenge (against Orban), and his media portfolio was a conduit for that," Policy Solutions analyst Tamas Boros said. "Now that he sees Orban with another two-thirds majority, it was no longer worth his while." "He sees the results, anticipates government revenge, and is shutting down unprofitable media organizations." Magyar Nemzet publisher's will also close Lanchid Radio, a sister radio station, at midnight on Tuesday and seek buyers for other Simicska group outlets. Orban has become the central European country's dominant leader by projecting himself as a savior of its Christian culture against Muslim migration into Europe, an image which resonated with more than 2.5 million voters on Sunday. Hungarian Prime Minister Viktor Orban speaks during a press conference in Budapest, Hungary, April 10, 2018. Orban's Fidesz party, in power since 2010, has turned public broadcasters into obedient mouthpieces, his closest allies have bought big stakes in privately owned media and advertising has been channelled to heavily benefit government-friendly outlets. Businessmen close to the premier purchased then-shuttered Nepszabadsag, the country's top opposition newspaper, in 2016. They also bought up nearly all regional dailies and acquired dozens of radio licenses covering the entire country. The only remaining independent publications with widespread reach are the RTL television group owned by Germany's Bertelsmann and the news website Index.hu, where a close Simicska associate sits on the board of the foundation that owns the company. The other independent national newspaper, Nepszava, is owned by ex-Socialist Party treasurer Laszlo Puch via an Austrian company, but has far less readership than Index.